Toronto is notorious for having ethnic enclaves and pockets within districts where you can get just about anything. With such a diversity of people, cultures and lifestyles in Toronto, its easy to find a neighbourhood you feel at home in. Toronto is the 5th most populous city in North America. Its metropolitan area has over 5.5 million people. The city is at the core of the Greater Toronto Area (GTA), with a population of 6,054,191 in 2011, according to the Census. The King West area is popular for lots of people who enjoy going out to bars, clubs and eating at great restaurants. Luckily, there are Toronto furnished apartments for rent in this neighborhood, like our unit in the Portland building. Our fully furnished 675 square foot contemporary suite at the Portland condos comes with an enormous 240 square foot terrace, beautiful outdoor furnishings and a gas powered BBQ. Outside there is a direct breathtaking view of the CN Tower. Renters can enjoy the luxurious kitchen with an under mount sink, stone countertops with seating for two, and stainless steel appliances. There is also a beautiful solid wood dining table with four cushy chairs perfect for a dinner party. The open concept layout of the unit is maximized by the flow of 6’’ wide engineered dark stained hardwood floors throughout. In the living room there is a shaggy rug which warms up the space that is filled with a modern couch and chair. There is a flat screen TV mounted on the wall and just under that is a large desk ideal for work or study. This suite is perfect for corporate housing in Toronto and extended stays as well. The spacious bedroom has a lovely queen sized bed and enough storage space for all your clothing and personal items. The bathroom is spa-inspired and has luxurious towels which are cleaned along with the sheets biweekly by the maid service. During the length of your stay you have the freedom to wash your own clothes with the en-suite washer and dryer. Also, you get to enjoy free wireless internet, cable TV and free parking. When you compare your stay at a Toronto serviced apartment to that in a hotel, you will quickly see how the benefits add up. Amenities in the building include a full fitness facility with high-end workout equipment and flat screen TV’s. Most impressively, there is an indoor and outdoor rooftop club with some of the best facilities downtown. At the bottom of the building there is a large grocer and a bank. 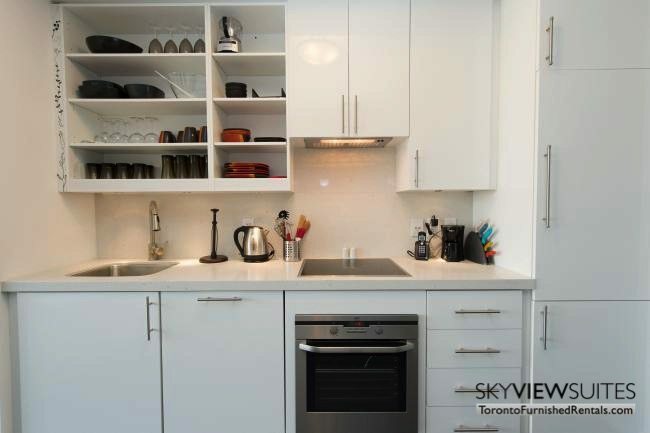 Opportunely, this edifice is located steps away from the chief King West district; this elegantly furnished unit is in a boutique building has every convenience at your doorstep. Just minutes away from the fashion, financial and entertainment districts, this residence is bordered by an immense array of restaurants, artisan shops, and museum and art venues. One of the bars included is Bier Market, which boasts over 100 types of beer from over 24 countries and also offers an eclectic menu. Brant House is located just off of King Street, on Brant Street; it’s a chic bar that morphs into a dance club after dinner. 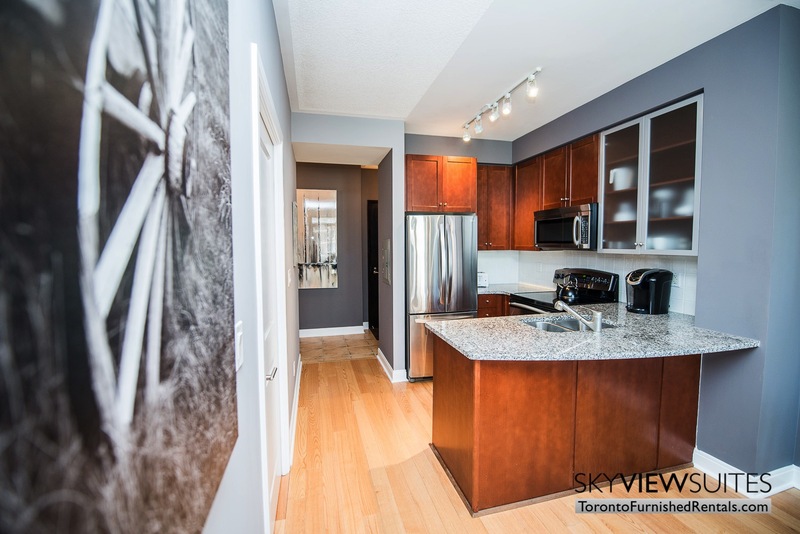 To make your Toronto accommodations at this suite or to see what other units we have available, click here: Furnished Rentals.